This New Year’s was a special one: I made unforgettable new memories with my host family – and realized just how far I’ve come in my relationship with them. My extended host family here in Thailand is very big; I have many aunts and uncles who all live very close to my home, and we all visit each other often. Whenever they can, my host family likes to host big dinner parties outside with the whole family, so it only made sense when my host mom told me that we would be throwing a big New Year’s party for the family as well. And this party was no joke. The day before, my host mom had enlisted my friend Kenna (another YES Abroad student who was visiting me on a week-long exchange), one of my host cousins, and me to decorate the front porch with balloons, tinsel, and a homemade sign reading “Happy New Year 2019!” There was even a karaoke station set up off to one side (it’s not a true Thai party without one). The party also had a Thai 80’s fashion costume competition, which meant that everyone came dressed in outfits that were as loud and colorful as they were creative. Once everyone had arrived and settled in, the contest began. All of the people who had dressed up took turns presenting themselves in a unique way on the makeshift “stage” (a sectioned off part of our front porch). One of my host aunts pretended she was a contestant in a beauty pageant, one of my host cousins danced to a song currently popular with Thai teenagers, and another host aunt performed a traditional Thai dance. 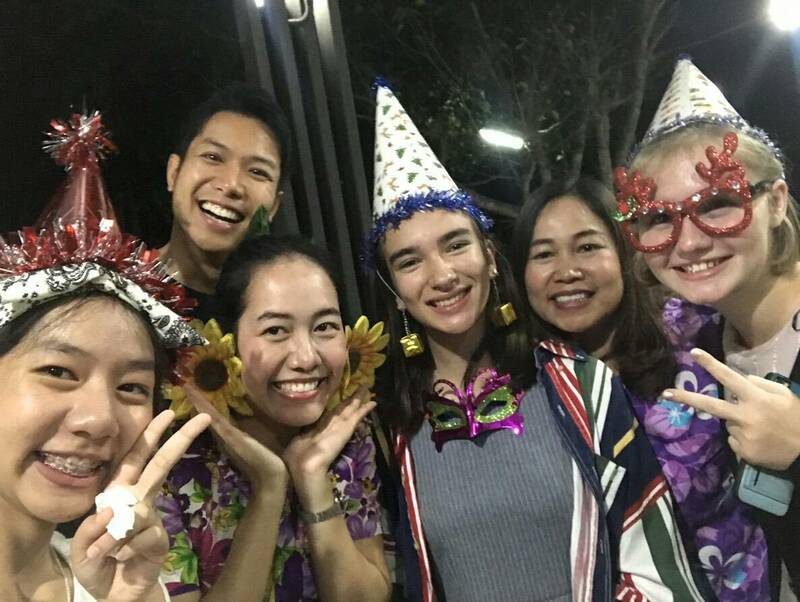 When it was my turn, my host family encouraged me to introduce myself to everyone in Thai as if I was meeting them for the first time. As I talked about myself, I became very aware of the fact that I, a person who generally shies away from talking in front of groups of any size even at home in the U.S., wasn’t feeling any sort of “stage fright” in that moment. I thought back to the first few months of my exchange, when I was timid around even my immediate host family, always feeling extra anxious and awkward during extended family gatherings like these. I realized that I now felt very comfortable and at home with this group of wonderful people, and I felt proud of this progress in adapting to my host community. After I introduced myself, my host family decided to “interview” me. They had my host sister get up onstage with me to help out with any words I didn’t know, and my family asked me many of the questions I’m now accustomed to being asked whenever I meet new people in my host community, like “Why were you interested in coming to Thailand?” and “What Thai dishes do you like the most?” My host family’s last question, however, was different from the usual ones: “How do you feel about living with our family?” Realizing that this was a perfect opportunity to show gratitude towards my host family for all that they do for me, I took a second to get my thoughts together, and then I answered from my heart. I explained how I feel ridiculously lucky to have ended up with my host family and that I am extremely thankful for them. I told them that I honestly believe they are the best host family I possibly could have gotten and that I’m going to be incredibly sad to leave them when my exchange is over (although I’m sure I will be back to visit them). After I finished talking, I looked over at my host sister and saw that she had started crying. I gave her a hug, shocked and moved by how much my words had affected her. Through tears, she translated what I had said for the rest of my host family. After that we both got off the stage and joined the rest of the party. More members of my host family came up to me and hugged me, and I realized that one of my cousins was crying, too. It meant so much to me to see that my host family and I have made real, lasting impacts on each other already. The party went on for the rest of the night. A vote was taken, and the contest winners were announced (my host cousin and two of my host aunts took the prize). We ate Mu Kratha, a kind of food that is originally from Korea and China but has become very popular in Thailand. People sang, danced, and just enjoyed each other’s company. 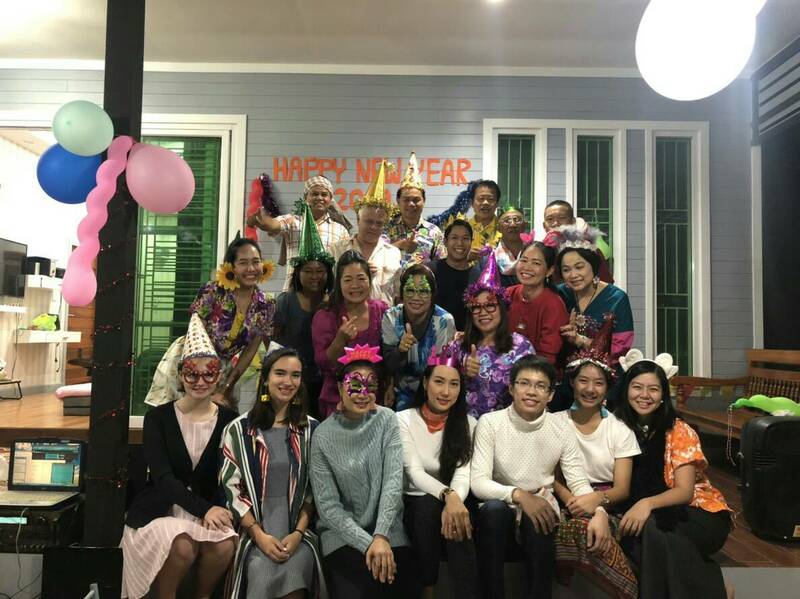 When midnight arrived, my host sister and cousins sprayed silly string everywhere and we all sang a Thai song that welcomes in the New Year. Kenna and I tried to keep up as best as we could, reading what we could as the lyrics popped up on the screen. After the song was over, things started winding down and people started saying goodnight. Kenna, my host sister, and some of my host cousins stayed up for a while longer, talking and playing cards. My host dad stayed up with us, singing karaoke song after song. When we finally decided to call it a night and began getting ready for bed, I reflected on the events of the night, my heart full. I knew that this day would be one I’ll remember long after my exchange is over. I am so full of love for my host family and so grateful that I get to share my exchange with them. Just seven months ago we were complete strangers, but now my life would be nowhere near complete without them.